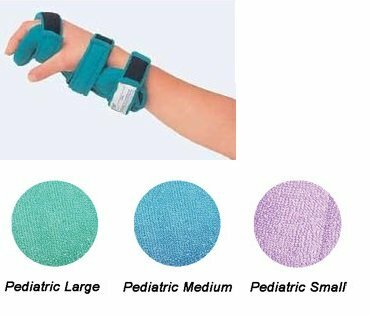 Product Overview Sammons Preston Comfy Pediatric Wrist/Hand/Finger Orthosis Large Extra Cover ComfyTM Pediatric Wrist/Hand/ Finger Orthosis. The perfect splint for hand positioning. Well-padded and washable, with indepen-dently adjustable hand, wrist, and forearm components, this splint comfortably prevents or reduces deformities. Protects healing wounds and the moisture-absorbing cover prevents skin maceration. Latex free. Soft straps accommodate sensitive skin as well as slight fluctuations in edema and fragile skin. Fully and easily adjustable at all joints to make a custom fit without the use of tools or heat guns.